Welcome, there's finally, a continuing education hair industry academy in National City, CA. Get training from an elite extension training program designed just for you. It's hard to find business owners/stylists to share information to help you with your future goals. Well, you have found your help. Get educated on how to run your small business and learn popular Hair Extension Weaving techniques trade marked by LaQues Corporate Training Academy. Increase your income to become a six-figure stylist, why settle for the average pay when you are in control of self? With this said, further your career today by learning these extension methods. Clients want what's popular, new, and less damaging to their hair. LaQues Corporate Training Academy will inform you of all the new hair extensions with online video previews and full videos you can purchase. We also offer, hands on training workshops, bootcamps, vendor information, salon contracts, and much, much more! These are professional techniques that should be serviced by a professional licensed cosmetologist or enrolled cosmetology student. If you feel you need One-on-One training @ your location or by traveling to National City, CA, private classes are available. We host most workshops here locally; however, some are held in major cities, maybe one is coming up near you soon? As leaders in the hair extension industry, we know how important it is for our salon clients to be in the safest, most knowledgeable hands. That’s why only stylists who have passed the rigorous training courses are permitted to apply our Bonded and/or Micro Weft hair extensions in salons across California and the U.S. Once they’ve trained as a LaQues Corporate Training Academy, they work closely with one of our Account Managers to make the most of their salon’s potential for profit. Imagine the pride you'll feel when you see your client leaving your salon with long, full locks. Because of your skills, you were able to give her hair that would take years to grow. She came in with thin, shoulder-length hair and left with 22 inches of healthy volume and length. Hair extensions are becoming more and more popular each year. It's easy to see why. Extensions offer so many possibilities for styling and wear. 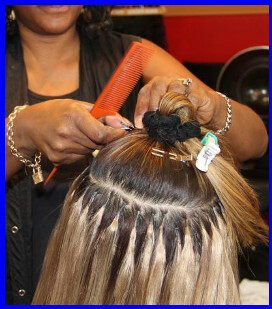 As a LaQues Corporate Training Academy Stylist, you can give your clients confidence of full, long hair. You can offer this amazing service in your salon and help your business grow and flourish. Through LaQues Corporate Training Academy Education, you can learn different methods of hair extensions: Seamless, Fusion, Micro-Links, Lace Units, Sewn-Ins and Tape-In. You can enroll in each Bootcamp separately, or purchase all three for a discount.